I’m always trying to find ways to bring the outside in! 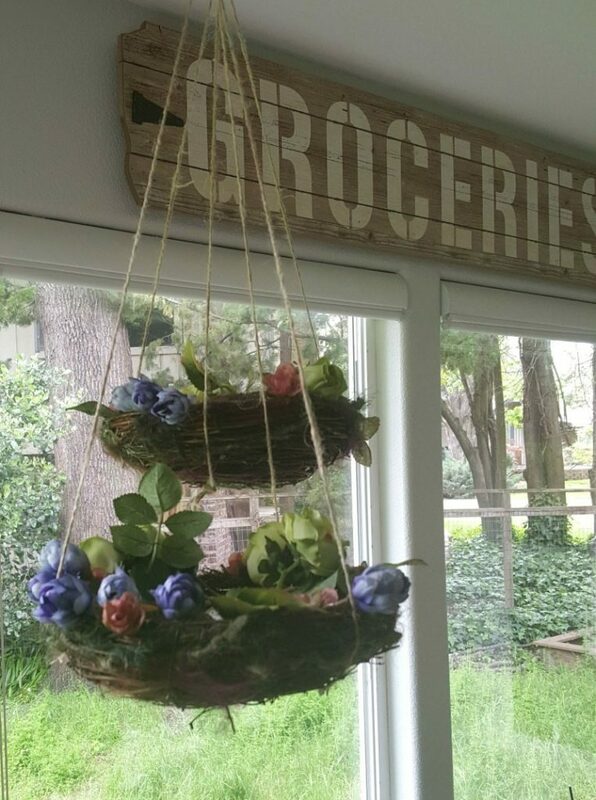 My latest project….these adorable organic hanging nests….is the perfect way to do just that! These are easy as pie!! 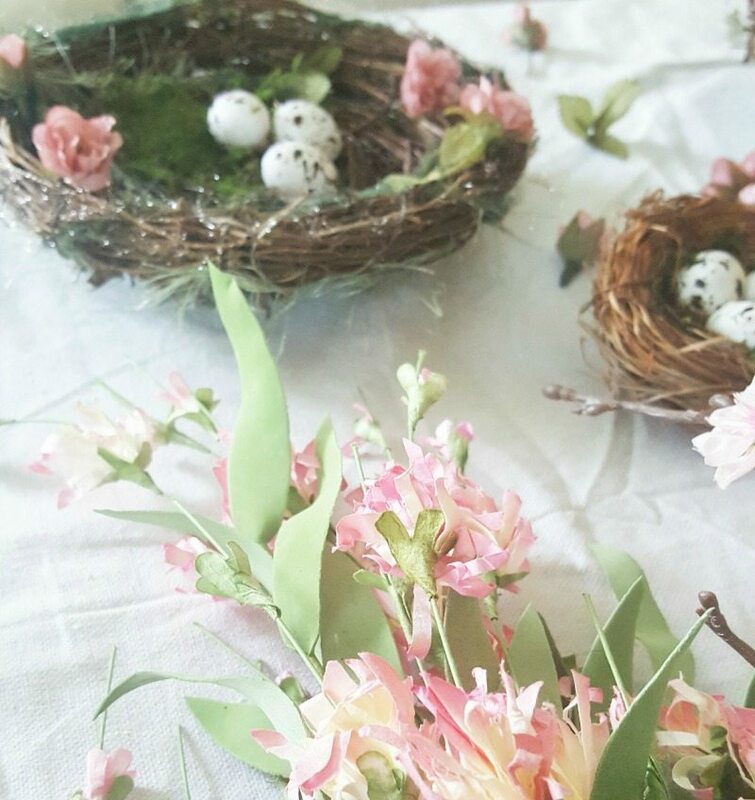 The idea is to create a nest that looks as much like the “real thing” as you want…or as elegant, colorful and detailed as you want! I love the descriptive word “organic”…because it suggests that anything goes. I had seen a few pictures that inspired me to do this project. Some were totally natural looking nests and others were very ornate. So….the field was wide open for interpretation! 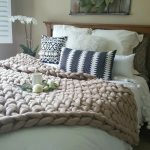 I teamed up with my crafting buddy and good friend Janine from www.HappyHappyNester.com and together we brainstormed what we wanted to make. (I hope you will check out her blog post in the next few days when she finishes her project). The truth is, before I started I had no idea what I wanted to create or what it would look like. But this gave me the freedom to design with an open mind and let my creativity guide me! Another reason I love the word “organic” is because there really is no right way to do it and better yet, no wrong way either! These easy steps are just a guide for YOU to discover what you want YOUR nest to look like! Have fun, be creative and let it unfold….organically! 2 small grapevine nests as my base. You could also make your own nests. I found this fun how-to on line. moss (I used this kind because I liked the realistic look and the color variations). faux flowers. Choose your color scheme and decide how much color I want in your nest. 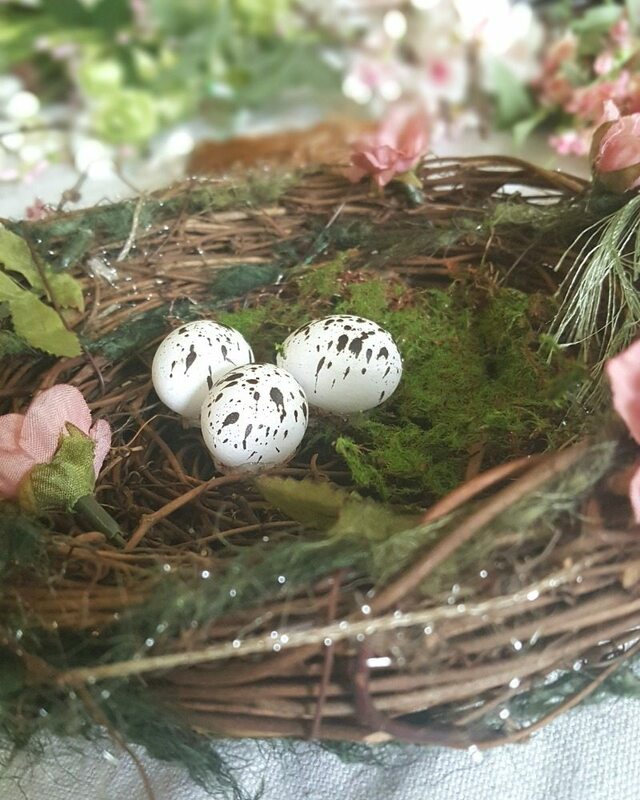 speckled eggs (I couldn’t find these sold separately so I bought two small nests that came with eggs attached and simply detached the eggs.) 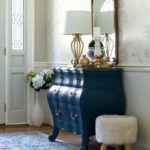 This link is to some cute blue eggs I found on-line. The rest I gathered from supplies I had around the house. faux flowers that were laying around (doesn’t everyone have gobs of extra faux flowers “laying around”??) I bought mine at Michael’s and Hobby Lobby. chose different colors, different textures…some with sparkle, some shaggy, some velvety. Some neutral, natural green and some brighter colors. next, add a few small flowers. I just “popped” some off my faux flower stems. You can stick the stem into the grapevine or you may want to hot glue to secure. lastly add the eggs and hot glue them in place. ribbon, either neutral, patterned or colored….of varying widths and sizes. 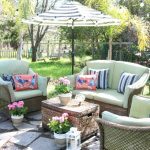 Measure and cut 3 strands that will give you enough length to hang from the ceiling or in the space you have selected (who knows…maybe you want to hang yours in your garden, from your outdoor pergola or gazebo). Make a small knot with the 3 strands together on one end. 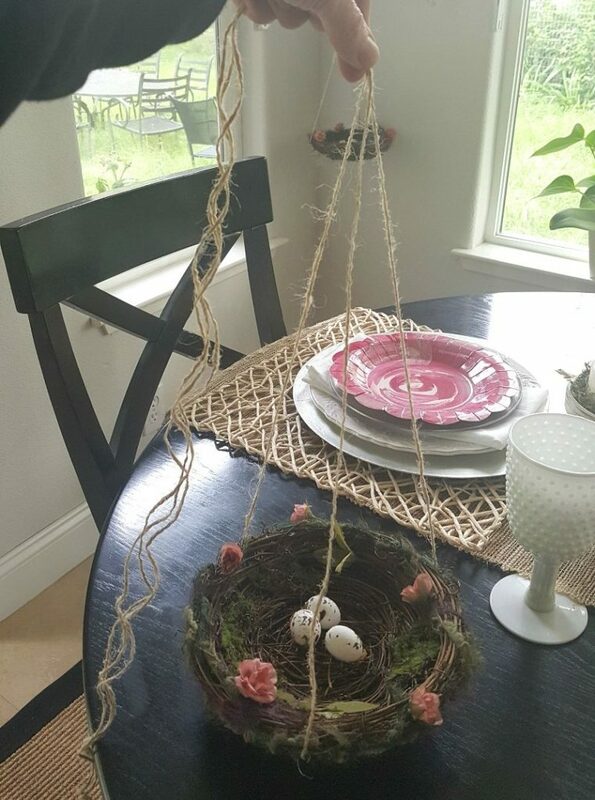 Place the center of the knot on a table and lay the nest on top so that each of the three strands is evenly placed around the edges. 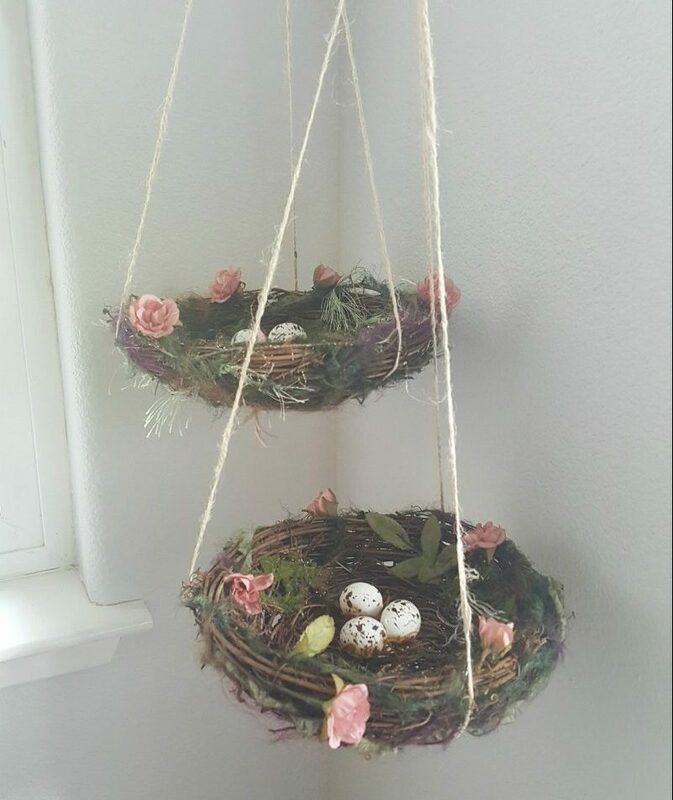 Find a good spot to hang your nests….maybe by a window, maybe where the lighting is good (in case you want to take a picture)…maybe where there isn’t too much other decor around so it can have it’s own “space”. 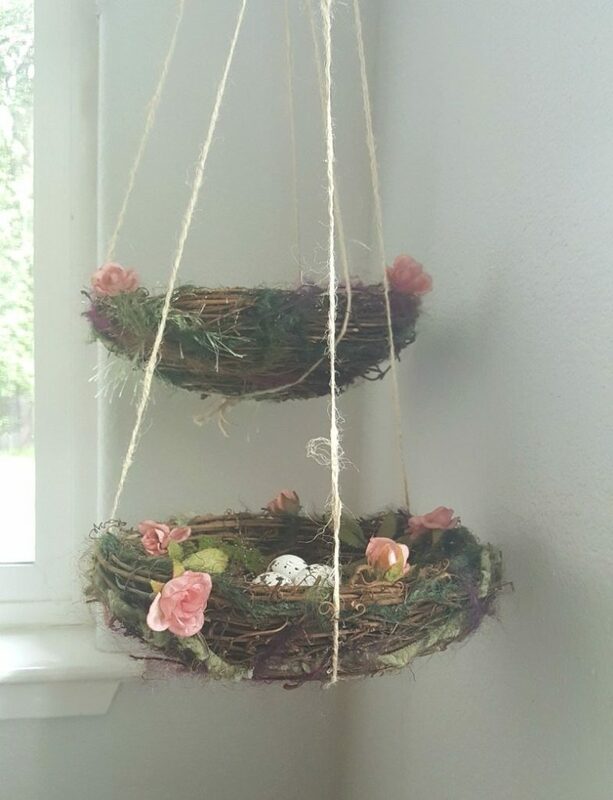 You can use any type of hook because these nests are so light weight, but considering the temporary nature of this project (maybe just seasonal) you might want to avoid unnecessary holes in your ceiling. I found these great command strip hooks that have small metal hooks that swing out creating the perfect ceiling hook! I hung mine by a window and played with the angles so they were staggered, placing one a little higher and the other a little closer to the wall. There are so many reasons we love this sweet project. Simplicity: not a lot of time, and hard to make a mistake! 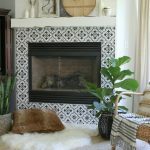 Affordable: a couple of inexpensive items from the store and basic crafting leftovers and your’re good to go! FUN: anything that allows freedom of expression and creativity spells FUN! In this version I decided to add some more faux flowers for a bit more festive color! I can’t decide which version I like better! This could be a great idea to host a fun event. Involve the kids, let them get creative. 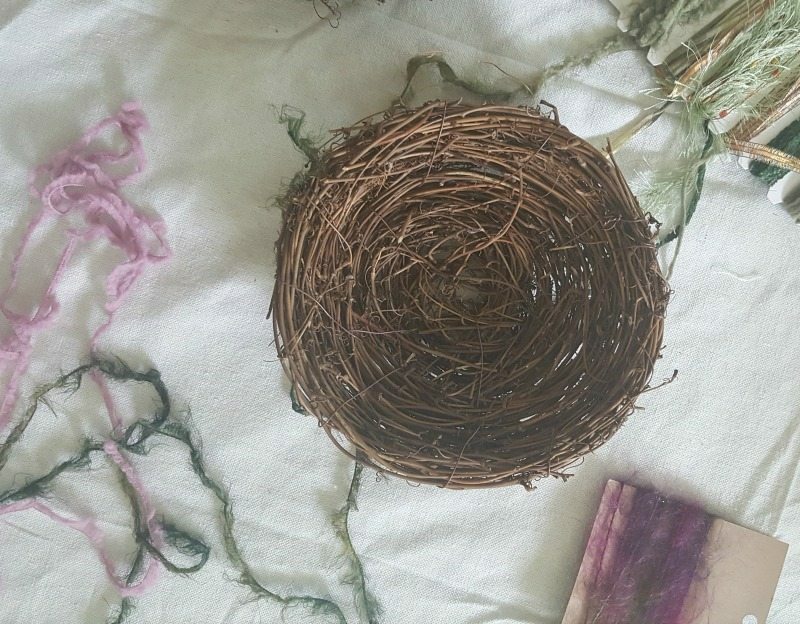 Host a ladies craft night giving everyone a nest and supplying a table full of craft supplies. Julie and I think it would make a great party craft with a unique take-home gift. You could have everyone donate for supplies to cover costs. We’re sure it would be a fun night to remember. 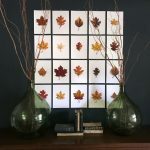 Whether you turn it into a family arts and crafts project, a ladies craft night, or do it on your own we hope you have as much fun as we did with this project! « When Are the Best Posting Times on Instagram? Cute, cute! I see some Easter fun with the girlies! ???? I’m going today to gather supplies with my little 6 year old granddaughter Nora. 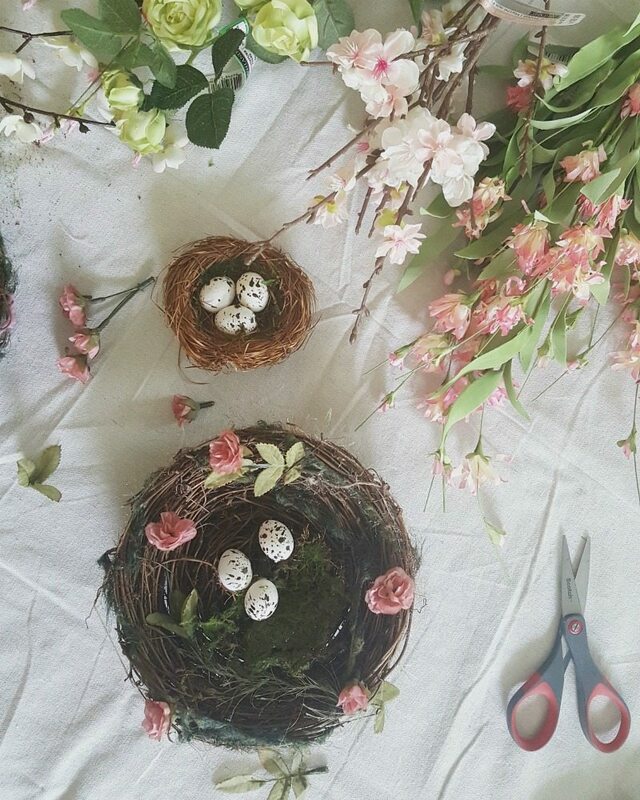 We are making these delightful nests to enjoy throughout the rest of spring. Thank you for your lovely post and for making this world of ours a little prettier and sweet for the rest of us. 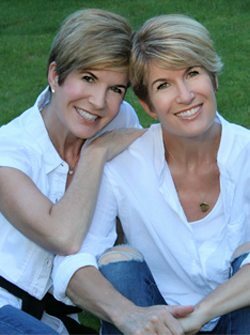 Love the design twins! ??????????????? ?